Black Arabian/SWB Sport Horse Filly. Born Feb 2003. Both parents approved by the ISR/Oldenburg Registry. This Filly has the best of both breeds. The Arabian influence is very evident in both Appearance and Temperament. 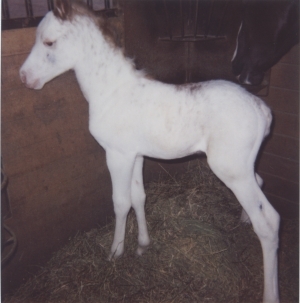 The Warmblood influence will be her size and movement. She Leads, Loads, Clips, Bathes, and stands for the farrier. Both parents and additional photos may be viewed by clicking photo above. Price is $6000 US located in Florida, USA. 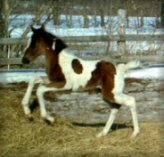 Maverick as we call him is a double registered Arabian Pinto colt. He is a proven halter champion already. The first time out he acted like he had done it a million times and every time out since then he is still in the blue ribbons. We have kept this colt in tact (stallion) as he has such beautiful Arabian type. He has height, substance, and gorgeous color that may be of interest to someone. He has a loving disposition. He is very early to handle, he loads in a trailer with ease, good for the farrier and his baths. 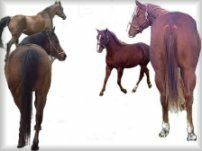 His sire is a multi-champion stallion even in the all-breed circuit. Price is $5500 US. Located n Upper Michigan. Please call (906) 942-7721 or email porticea@aol.com.....or check us out on the web by clicking photo above. Half Arab/Friesian born 03/05/2001. This Guy has a LOT of Potential! As he got the Best of Both Breeds, Movement,Size & Power as well as Stamina & Endurance! Lots of Mane and Tail. Sold to a National Level Dressage Rider!